255 pages | 6 Color Illus. | 37 B/W Illus. 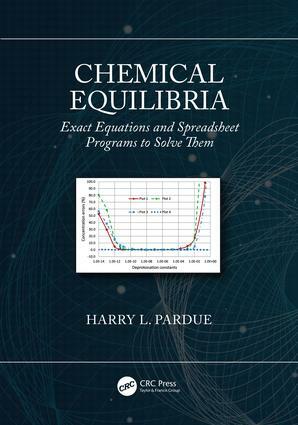 Concepts, procedures and programs described in this book make it possible for readers to solve both simple and complex equilibria problems quickly and easily and to visualize results in both numerical and graphical forms. They allow the user to calculate concentrations of reactants and products for both simple and complicated situations. The user can spend less time doing calculations and more time thinking about what the results mean in terms of a larger problem in which she or he may be interested. I was born and grew up in southern West Virginia where I attended public schools and graduated from Chapmanville High School in May, 1953. I enrolled as a chemistry major in Marshall College, Marshall University now, in June 1953 and graduated with BS and MS degrees in 1956 and 1957, respectively. I then enrolled as a graduate student in the Department of Chemistry and Chemical Engineering at the University of Illinois in Urbana/Champaign in September 1957. I joined Prof. H. V. Malmstadt’s research group during the summer of 1958 and earned a PhD degree with emphasis in analytical chemistry in June, 1961. I then joined the faculty in the Department of Chemistry at Purdue University in September of that year. I served as Head of the Analytical Division in the department from 1969 to 1975 and as Head of the Department of Chemistry from 1983 – 1987. I served as the American Editor for Analytica Chimica Acta for more than ten years, as Chairman of the Division of Analytical Chemistry of the American Chemical Society for one year and on numerous committees for a variety of professional societies. My research focused on chemical instrumentation and advances in kinetic-based methods. I directed the thesis research of some sixty masters and doctoral students and was the lead author on more than 175 scientific papers. Research awards include the ACS Award in Analytical Chemistry sponsored by Fisher Scientific, The Anachem Award for distinguished service to analytical chemistry, The Chemical Instrumentation Award, The Association for Clinical Chemistry Award for contributions to clinical chemistry and The Samuel Natelson Award for Advancements in Clinical Chemistry. After I retired in 2002 I continued as a visiting professor for two years during which time I worked with two graduate students, Ihab Odeh and Twelde Tesfai, to expand the scope of the introductory course in analytical chemistry and to develop a new set of experiments for the course. Some changes were to decrease emphasis on analyzing unknowns and increase emphasis on several topics including automated titrations, liquid chromatography, derivative spectroscopy, kinetic-based methods, applications of enzymes as selective reagents and the use of computers to collect and process laboratory results. I have seldom worked harder, had more fun or been more pleased with the results of our efforts.